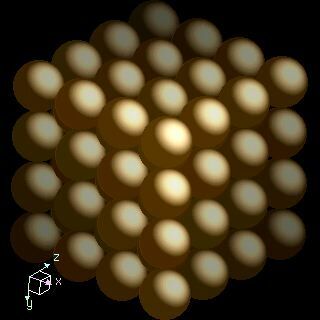 Iron atoms have 26 electrons and the shell structure is 2.8.14.2. The ground state electronic configuration of neutral iron is [Ar].3d6.4s2 and the term symbol of iron is 5D4. Iron: description Your user agent does not support the HTML5 Audio element. Iron is a relatively abundant element in the universe. It is found in the sun and many types of stars in considerable quantity. Iron nuclei are very stable. Iron is a vital constituent of plant and animal life, and is the key component of haemoglobin. The pure metal is not often encountered in commerce, but is usually alloyed with carbon or other metals. The pure metal is very reactive chemically, and rapidly corrodes, especially in moist air or at elevated temperatures. Any car owner knows this. Iron metal is a silvery, lustrous metal which has important magnetic properties. Iron filings salts cause sparks in flames. 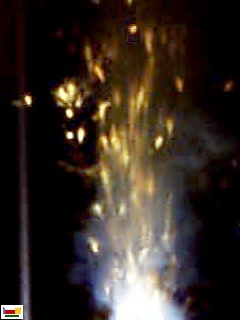 The picture above shows the result from adding iron filings to a burning mixture of potassium chlorate and sucrose. Do not attempt this reaction unless are a professionally qualified chemist and you have carried out a legally satisfactory hazard assessment. The solid state structure of iron is: bcc (body-centred cubic). Reactions of iron as the element with air, water, halogens, acids, and bases where known. Binary compounds with halogens (known as halides), oxygen (known as oxides), hydrogen (known as hydrides), and other compounds of iron where known. Bond strengths; lattice energies of iron halides, hydrides, oxides (where known); and reduction potentials where known. Iron was discovered by known since ancient times in unknown at not known. Origin of name: from the Anglo-Saxon word "iron" or "iren" (the origin of the symbol Fe comes from the Latin word "ferrum" meaning "iron"). Possibly the word iron is derived from earlier words meaning "holy metal" because it was used to make the swords used in the Crusades.. 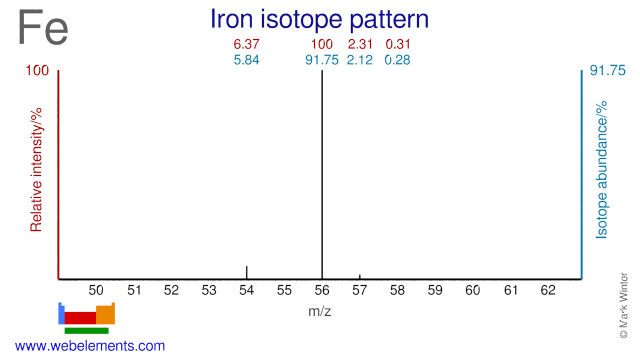 Isotope abundances of iron with the most intense signal set to 100%. Isolation: it is not normally necessary to make iron in the laboratory as it is available commercially. Small amounts of pure iron can be made through the purification of crude iron with carbon monoxide. The intermediate in this process is iron pentacarbonyl, Fe(CO)5. The carbonyl decomposes on heatingto about 250°C to form pure iron powder. The Fe(CO)5 is a volatile oily complex which is easily flushed from the reaction vessel leaving the impurities behind. 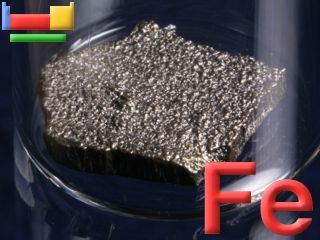 Other routes to small samples of pure iron include the reduction of iron oxide, Fe2O3, with hyrogen, H2. Nearly all iron produced commercially is used in the steel industry and made using a blast furnace. Most chemistry text books cover the blast furnace process. In essence, iron oxide, Fe2O3, is reduced with with carbon (as coke) although in the furnace the actual reducing agent is probably carbon monoxide, CO. This process is one of the most significant industrial processes in history and the origins of the modern process are traceable back to a small town called Coalbrookdale in Shropshire (England) around the year 1773.